We infer geoacoustic properties of seabed sediment layers via remote sensing using underwater sound from a container ship. While several techniques are available for seabed characterization via acoustic remote sensing, this is a first demonstration using noise from a large ship-of-opportunity (i.e., a passing ship with no connection to an experiment). A benefit of this passive acoustics approach is that such sound is readily available in the ocean. Our data were collected as part of a large coordinated ocean acoustic experiment conducted at the New England Mud Patch in March, 2017 . To investigate properties of a muddy seabed, the experiment employed multiple techniques including direct measurements by geophysical coring  and remote sensing using sound from various controlled acoustic sources. Our team deployed a 480-m long linear array of hydrophones on the seabed to record noise from passing ships. The array was located two nautical miles from a commercial shipping lane leading to the Port of New York and New Jersey. An average of three ships passed the array daily. We identified ship passages by “bathtub” interference patterns (Fig. 1) in the recordings. The structure seen in Fig. 1 is due to the interaction between ship-to-hydrophone sound paths, some interacting with the seabed, shifting with time as the ship passes the hydrophone. Ship locations were obtained from Automatic Identification System data provided by the US Coast Guard Navigation Center. This enabled us to run a numerical model of underwater sound propagation from source to receivers. The final step is inverse modeling, where a large number of possible seabed models were sampled probabilistically, with each model used to predict the corresponding sound field that was matched with the recorded data. We used Bayesian sampling and statistical inference methods based on . 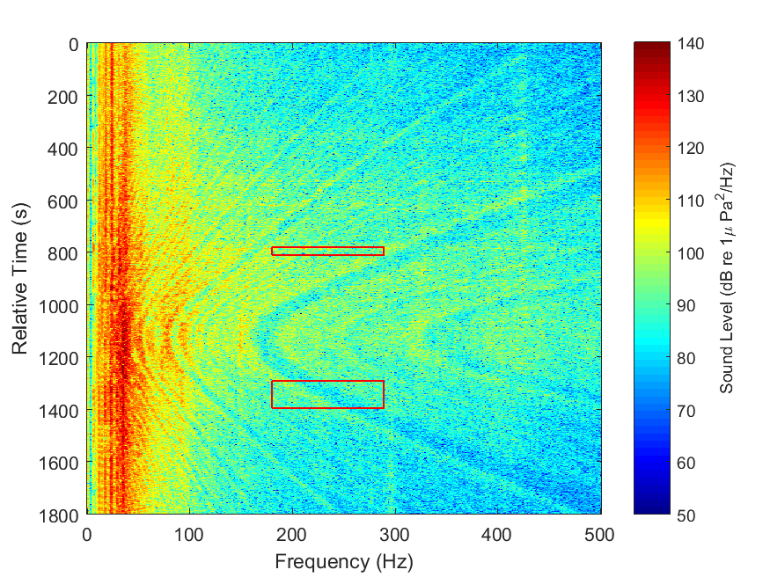 Inferred geoacoustic profiles (Fig. 2) indicate fine-grained sediment (mud) in the upper seabed and coarse-grained (higher sound speed and density) sediment (sand) in the lower seabed. Results are in overall good agreement with sediment core data. This work establishes that noise from large commercial ships can contain usable information for seabed characterization. [Work supported by the Office of Naval Research, Ocean Acoustics. Any opinions, findings, and conclusions or recommendations expressed in this material are those of the authors and do not necessarily reflect the views of ONR]. 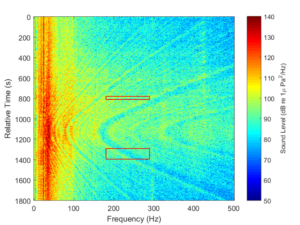 Figure 1 Spectrogram of noise measured on a hydrophone on the seabed (left) due to a passing container ship (right). 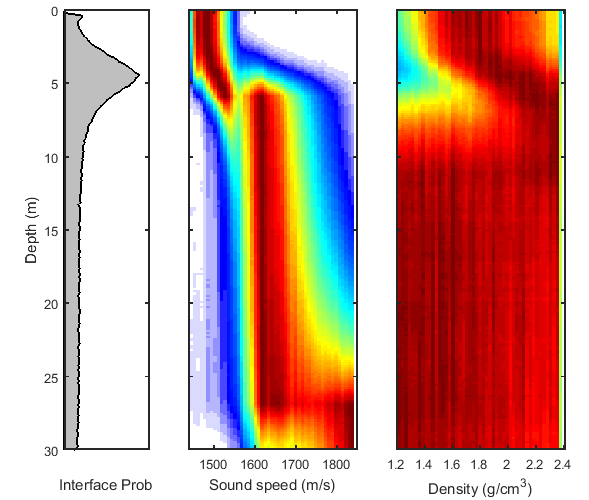 Figure 2 Inversion results in terms of probability densities for sediment layer interface depths (left), and geoacoustic properties of sound speed (middle), and density (right) as a function of depth into the seabed. Warm colors (e.g., red) indicate high probabilities. P.S. Wilson and D.P. Knobles, “Overview of the seabed characterization experiment 2017,” in Proc. 4th Underwater Acoustics Conference and Exhibition, 743-748, ISSN 2408-0195 (2017). J.D. Chaytor, M.S. Ballard, B. Buczkowski, J.A. Goff, K. Lee, A. Reed, “Measurements of Geologic Characteristics, Geophysical Properties, and Geoacoustic Response of Sediments from the New England Mud Patch,” submitted to IEEE J. Ocean Eng. (2018). S.E. Dosso, J. Dettmer, G. Steininger, and C.W. Holland, “Efficient trans-dimensional Bayesian inversion for seabed geoacoustic profile estimation,” Inverse Problems, 30, 29pp (2014).